Lucky Paws has always been found that by being kind, kindness returns back to you. So, there was no question that we wanted to be kinder to the environment! At first, becoming eco-friendly seemed a bit intimidating, as animals require a lot of goods! However, once we really put our heads, hoofs and paws together, we found ways that to lower our carbon paw-print! Below are just a few ways we are helping the environment and we hope it inspires you to also try and be kinder to our planet! We continue to plant trees! This is a double benefit as it shades the animals and helps control the climate of the sanctuary. Not to mention, it provides more homes to birds and other living creatures. These “adopted” trees also have personalized plaques on them for an ongoing legacy to our donors family or pets. If interested in adopting a tree, click here! We use newspaper and shredded paper for our animals for bedding, litter and many other things! Since there are still reasons t use paper, instead of tossing it, drop it off in our receptacle bin behind Rage Cycles in Scottsdale and we will put it to good use! All weeds or greens on our property are eaten by animals! The goats and cows love this stuff! To reduce landfill waste we use Kuranda beds instead of couches for recycle. We also reuse towels and blankets so your linen closet of old laundry doesn’t go to waste! We have our own water tank with carbon filters and what would normally go down the drain is now preserved for plants and the grounds! Laundry that has been done is dried by sunlight! And since we are located in Arizona, why not take advantage of what the sun has to offer! Dishes and bowls are washed by hand and if they need to be dried, we either use the sun or re-use towels. We do our best to refrain from using paper towels. We use energy saving light bulbs. Dog hair from grooming or shedding is also used! The majority of the birds like to use the hair for the nests and bedding they build so we always keep some on hand for them! Insecticides are a no-no for us so if we need to control any insects, we use things like peppermint oil, coffee grounds, etc. Any food scraps or wastes we try and compost! Above are a few ways we’ve made some pawsitive changes. We will continue to try new approaches to ways we can help Mother Earth. We are looking to also build raised gardens to grow food for the animals (cabbage, berries, etc) as well having the sanctuary powered by solar energy. 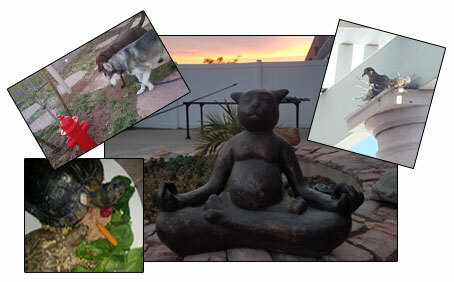 Lucky Paws is currently trying to raise funds for solar panels and installation. Overall, this will help the sanctuary save thousands of dollars in electric costs and will also save the environment. Please consider donating to help us become even more eco-friendly! !